A Mood Chart is a simple tool that people diagnosed with Bipolar disorder (like me) use from time to time. its basically a daily or bi-daily chart of symptoms and affect mood. With the K.I.S.S (keep – it- simple-stupid) attitude in mind, a mood chart can be made to meet any personal symptoms and then taken to to a doctor and therapist. In the last couple years my bipolar symptoms have been sporadic and relatively mild. I credit this towards my good attitude, good management, and to good luck. (you cannot under estimate luck, and the attitude to take advantage of it). I thought I’d finish a down loadable mood chart. 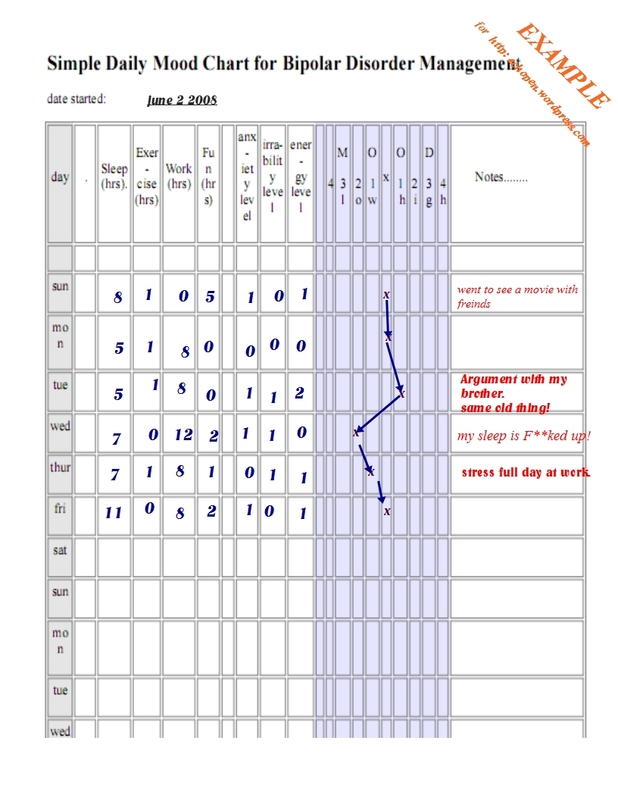 "example of a bipolar disorder mood chart"
above you will see an example of how one is filled out. you can simply create you own. managers of disorders : Depression, Bipolar disorder, Borderline Personality disorder often use these. you can also download my pre made PDF. visiting the “charts” tab above or click here for charts. the chart is free, but please feel free to donate any kleenex and cough drops to Pennsylvania Echoes, im going back to bed. Chris: Missed my blog and my research daily, so hopped on back. I couldn’t believe how the viewers stayed on during my absence through – goes to prove that people are just looking for answers to anything on mental illness and can’t find it. Search engines just ‘aint all that good sometimes; they need us! P.S. I like your new look. I will steer you to a Mental health Directory idea, the “untreatable” is working on. I am short on time,right now, but i will post in support of this idea, hopefully this week. When I was coming to terms with self harm I found that by tracking my moods I was able to distinguish a rather noticeable pattern so in turn I was able to be more aware of the situation so that I would be able to put my emergency plan into place. Also by tracking moods I was able to tell when my medication was effective and when it was lacking which gave my doctor the information that he needed to balance out the chemical end of my illness to a higher degree. A very useful tool that is for sure. Thanks for the mention above by the way. I believe you are number two on the list but still lacking a description. Very good… what else do you have… can I give this away freely on my Mental Health Humor Blog? please mention https://echopen.wordpress.com/ were you found it.